Original Post (18 Oct): It seems the latest Photoshop update is not compatible with the GrutBrushes plugin and will cause it to stop working. The brushes still work of course, the problem is just with the plugin. I have written to my plugin developer to see if they can help, but until then it looks like updating to the latest version of Photoshop will disable the GrutBrushes plugin. Re-installing it does not seem to fix it. 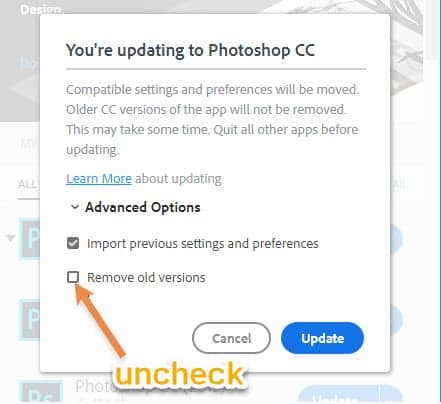 If you want to keep the old version of Photoshop installed as well as the new one you can uncheck the “remove old versions” box when updating. This will install the new version and keep the old one installed. 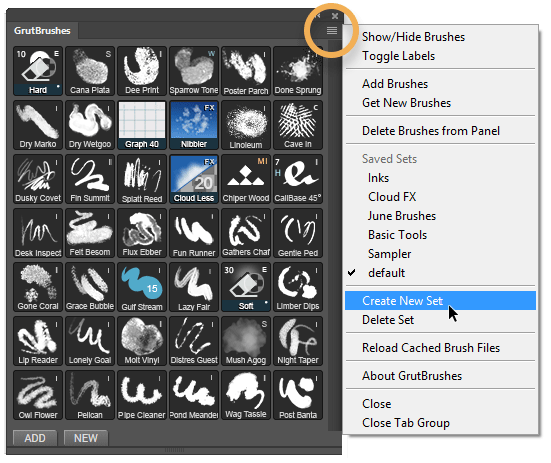 if you have already upgraded and don’t want to install the previous version you will have to access the brushes from the Tool Presets panel. I’m very sorry for this but I had no idea Adobe would be doing this. I hope I can find a solution soon. Stay tuned. I will update you here as soon as I hear. Download the latest version from your account page or get it here if you don’t have the plugin yet. Select “Create New Set” from the menu at the top right of the panel You can also access all menu items from the popup menu by right clicking anywhere in the panel. Name your custom set of brushes. TIP: Hold cmd/ctrl and or Shift to select multiple brushes. From the list that appears, those on the left will appear in that set while those on the right will not. You can add or remove brushes from the set by moving them from one column to the other using the arrow buttons. Some brushes needed to be updated to work with the new plugin, namely the Cross Hatching brushes and a few of the brushes in the Sampler Set. If you downloaded those before June 25th and are getting an error when you try to load or use them you will need to download them again from your account. Current ArtBrush members can re-download the full brushes zip from your account page. If you experience any problems with any particular brushes let me know. 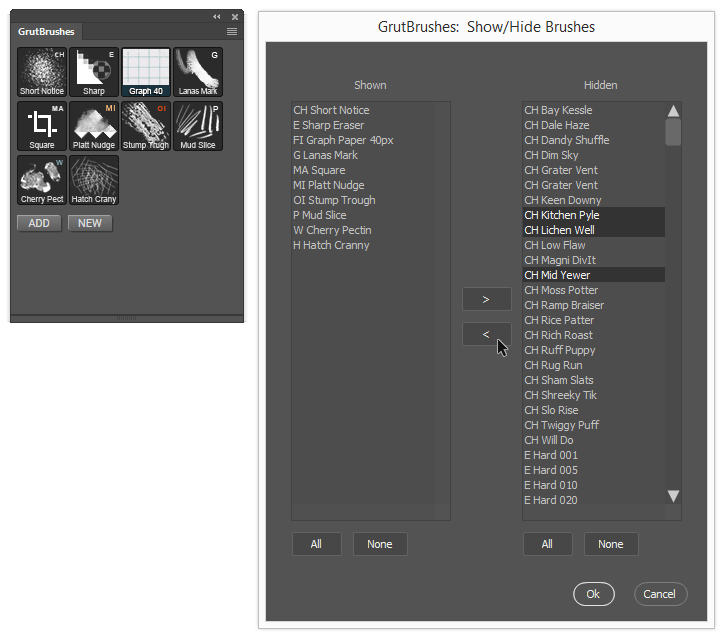 The latest Photoshop upgrade is a full installation, If you upgrade the GrutBrushes plugin to V1.2.1 before you upgrade Photoshop to 2015.5 you should find the GrutBrushes plugin already installed in version 2015.5 after you upgrade. Download it from your account and extract the zip file. Then, in Photoshop, Select File > Scripts >Browse and select GrutBrushes_installer.jsx file. When it’s done, restart Photoshop. You can also try dragging the jsx file into Photoshop or double clicking on it in Windows Explorer or Finder on Mac. Select File > Scripts >Browse and select GrutBrushes_installer.jsx file in the directory you just extracted it to. Any questions just send me an email or Leave a message below! I hope you get as much enjoyment out of the new ‘saved sets’ feature as much as I am. This Free Photoshop sampler set of 10 free Photoshop brushes and tools for digital artists is yours for free to celebrate 1 full year of giving away a new free Photoshop brush of the week for 52 weeks straight! http://grutbrushes.com/sampler If you’re using Photoshop CC 2014/15 Download it with the free GrutBrushes plugin panel for the full effect or simply use them in your Tool Presets panel. This image was created using only the tools in the GrutBrushes sampler on a paper background with no post processing. 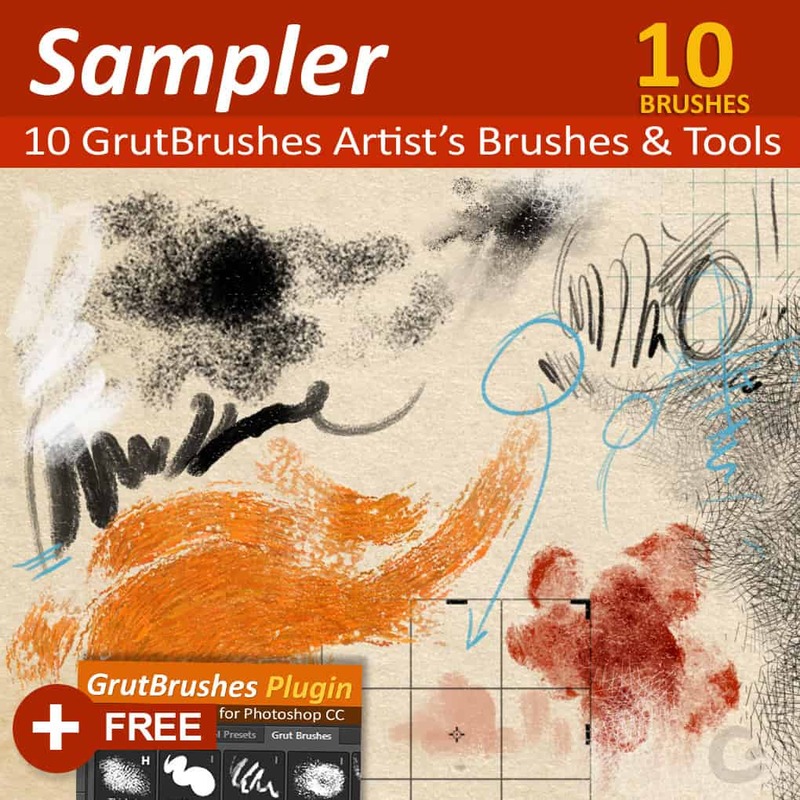 To get Every single Artist’s Brush from GrutBrushes without waiting 180 weeks click here! 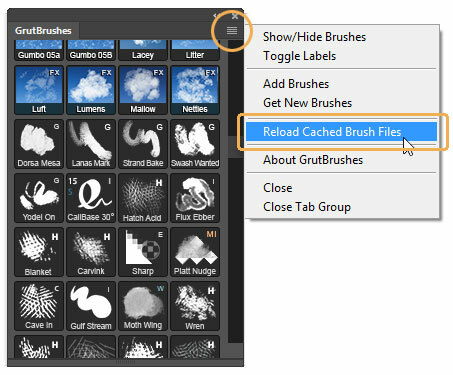 The GrutBrushes Photoshop plugin for Digital Artists has been updated! 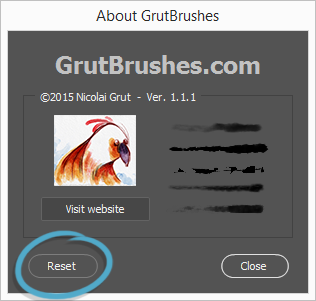 Version 1.1.1 of the GrutBrushes plugin is ready! If you need to update it you can download it from the available downloads section on your account page. If you don’t have it yet, you can get the GrutBrushes Photoshop plugin for free here. This may be a ‘minor’ plugin update but it includes some new features and quite a few fixes that may be rather major to those who requested them! When you pick a brush, the border now lights up in white. This will remain ‘on’ until you pick another GrutBrush, even if you change the settings or pick another tool from the Photoshop menu. Clicking on it again will reset that brush to its default settings. If you do ever want to add back in all your brushes and reload duplicates by accident, you no longer have to click “ok” to overwrite each one. Just click “apply to all” and any duplicates will be over-written. This is useful if you want to add a number of brushes and don’t remember which ones you already loaded. Load Brushes from Zip file – No more unzipping first! You can now just select the zip file that contains your brushes when adding a new brush, you no longer have to unzip it first! This is a nice time-saver and will also allow for downloading and installing sets of multiple brushes from one single file. When adding Photoshop brushes and tools to the panel, you will now only see the relevant TPL files in the file requestor and other non-installable files will be hidden from view. If you need to uninstall the old one, here are detailed manual uninstalation instructions for both PC and Mac are included in the zip file. If you are having trouble using the Automatic installation or would like to install it manually there are manual plugin installation instructions here which are also included in the zip file.